La Flamenka Hostel i Sevilla, Spanien : Boka nu! Tarifa Grupos: 8 o más personas se considera grupo. Para la confirmación de la reserva el establecimiento cargará el 50% de la estancia total. Para cancelar y/o modificar debe de hacerse 7 días antes de la llegada al establecimiento, para grupos +10 personas, se debe de cancelar y/o modificar 20 días antes de la llegada. Our house is located between the commercial, leisure and historic centre of the city and the Isabel II Bridge, which leads to the magic Barrio de Triana, one of the most emblematic, flamenco flavoured neighbourhoods of Sevilla. Here you will find both private and shared rooms. The bathrooms are separated by gender, outside of the rooms, comfortable and spacious. Just like in any home (since it will be yours for a few days), you can find a living room, TV, washing machine and a lovely kitchen where you can cook, exchange gastronomic knowledge with other fellow travellers and keep your food fresh in the fridge. And don´t forget to visit our wonderful terraces, with spectacular views of the Cathedral and the Giralda, and where you can find fun activities as well as a quiet corner to rest and relax. 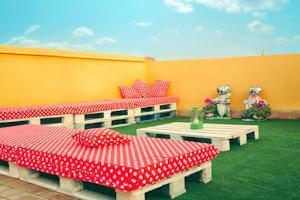 You will not forget your visit to Sevilla if you choose us for your stay.